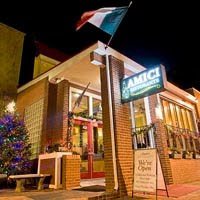 Amici, one of Richmond's stalwart restaurant traditions, recently underwent a renovation to its space. It's warmer and more roomy, but I think they missed a great opportunity to update their menu as well. While I generally like Amici, their menu seems a bit tired. I understand that they have had 20 years of success with a tried and true product, but still I wanted more. You can read all about it in this week's Style Weekly. I don't know how you can compare Amici to MammaZu. You must be dumb. The service left something to be desired at Amici? As opposed to what, blatant disregard for your dining experience? Unbelievable. As someone who is in the ACTUAL restaurant business, I'd like to point out that I will go to Amici 3-5 times before I end up at either of Vasaio's dives. The comparison doesn't even work. The food is anything but elegant at the Zu'--mostly spicy red sauce and canned sliced mushroom on everything. Amici does classical Italian, not Gabagool, and you, sir, seem ill-equipped to tell the difference. Nice article. Dummy.